National security, a topic routinely discussed behind the closed doors of Washington's political scientists and policymakers, is believed to be an insider's game. All too often, such highly specialized knowledge is assumed to place issues beyond the grasp--and interest--of the American public. Author D. Robert Worley disagrees. Unfortunately, due to sales rights restrictions, we cannot offer Orchestrating the Instruments of Power for sale in your country. National security, a topic routinely discussed behind the closed doors of Washington's political scientists and policymakers, is believed to be an insider's game. All too often, such highly specialized knowledge is assumed to place issues beyond the grasp--and interest--of the American public. 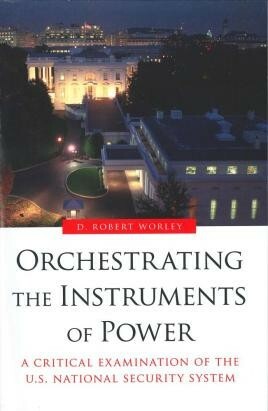 Author D. Robert Worley disagrees. The US national security system, designed after World War II and institutionalized through a decades-long power conflict with the Soviet Union, is inadequate for the needs of the twenty-first century; and while general consensus for a metamorphosis of the system is no longer in dispute, a clear and direct route for a new national security strategy proves elusive. Furnishing both specialists and interested citizens with the tools to assist in future national security reforms and discussion about reform, Orchestrating the Instruments of Power: A Critical Examination of the U.S. National Security System collects and synthesizes the concepts of America's economic, political, and military instruments of power.